Sinjin Hawke and Zora Jones - Vicious Circles. Vinyl EP. Bleep. Sinjin Hawke and Zora Jones, both big hitters in the global clubsphere and the minds behind the Fractal Fantasy audio-visual collective, unite for their first collaborative EP. 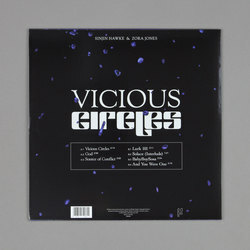 As one would expect from such potent and inventive producers, Vicious Circles is a record of futuristic club fare that also looks beyond the dancefloor for influence. Not many other producers would throw Bulgarian choirs and grunge guitars into a club tune like the title track, but Hawke and Jones pull it off. The final result is reminiscent of Hirakish and IVVVO. Elsewhere ‘God’ is a updated take on the Timbaland sound that was so prevalent in pop a decade ago, ‘And You Were One’ could be a Kelela instrumental, and ‘Lurk 101’ is high-fashion juke.